Look to your left, look to your right, look all around. What do you see? What do you hear? What do you experience? What drives you? What do you most value? These elements all form the climate of the University of Kansas. Assessing KU’s climate — how well we as an institution value others and enable their success — is crucial to our continuing improvement as an exceptional university. At the University of Kansas we seek to create an environment characterized by openness, fairness, and equal access for all students, staff, and faculty. Creating and maintaining a community environment that respects individual needs, abilities, and potential is critically important. A welcoming and inclusive campus climate is grounded in mutual respect, nurtured by dialogue, evidenced by a pattern of civil interaction, and is one of the foundations of our educational model. 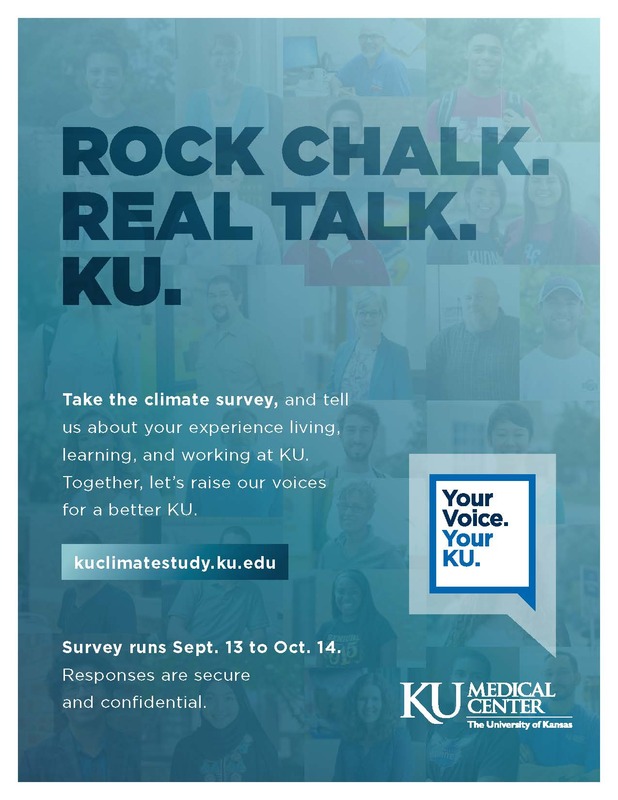 Thanks to all who participated in the university-wide Climate Study Survey. The Executive Summary for the KU Medical Center provides an overview of responses from the fall 2016 survey. The Full Report for the KU Medical Center provides all of the responses from the fall 2016 survey. The Full Presentation for the KU Medical Center from the June 21st, 2017 session provides an overview of the results from the fall 2016 survey. The Executive Summary for Lawrence and Edwards campus provides an overview of responses from the fall 2016 survey. The 600+ page Full Report for Lawrence and Edwards campus provides all of the responses from the fall 2016 survey. The Full Presentation for Lawrence and Edwards campus from the March 29th, 2017 sessions provides an overview of the results from the fall 2016 survey. 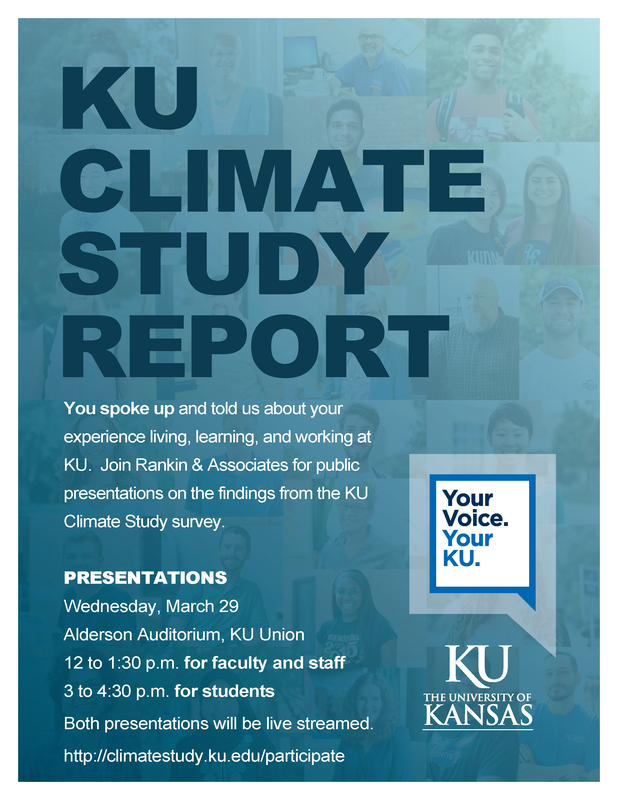 Unit-level reports for the Climate Study are available on the Office of Institutional Planning and Research for both the Lawrence and Edwards Campus and the KU Medical Center campus. The unit-specific reports are a priority as they represent potentially important contributions toward KU’s overall efforts to assess and improve the working, learning and living conditions at the university. As was stated earlier, availability of unit reports — as well as the amount of detail within each report — is dependent upon the level of survey participation within a specific unit. These measures help ensure confidentiality that was promised to survey participants. All unit reports compiled from the quantitative data set were shared publicly.